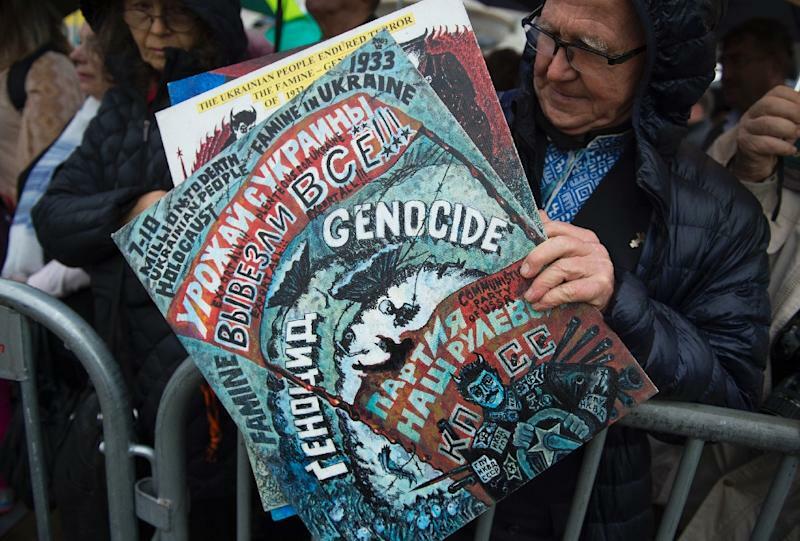 Washington (AFP) - A monument commemorating the millions of Ukrainians who died during a Soviet-era famine was unveiled in the US capital, in a ceremony that brought back horrific memories for survivors. "It's terrible, I will never forget," 90-year-old Alla Gromow, in a wheelchair, said as she recalled how neighbors engaged in cannibalism in a desperate bid to stay alive. 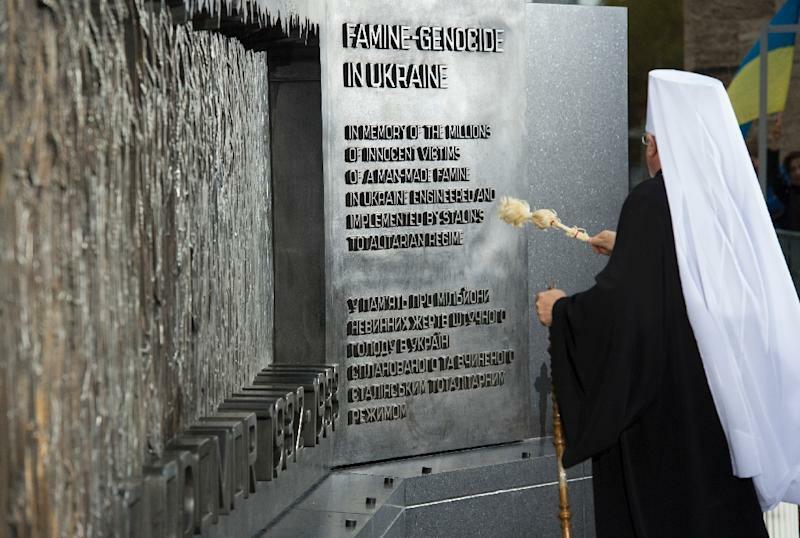 Ukrainians refer to the 1932-33 famine as Holodomor -- or "death by hunger" -- and blame the regime of dictator Joseph Stalin for the deliberate starvation of men, women and children. The memorial -- a bronze sculpture on a stone wall depicting stalks of wheat symbolizing the seizure of grain by the Soviets -- is located just steps from the grounds of the US Capitol and Washington's bustling Union Station. Ukraine's first lady, Maryna Poroshenko, was among a throng of people of all ages who packed nearby Columbus Circle for the ceremony, many wrapped in or waving Ukrainian flags and wearing traditional attire. "The famine was an attempt to force the Ukrainian people to their knees, to deprive us of our dignity, to destroy our national identity and to kill our hope for the right to create our own destiny in our own land," Ukrainian President Petro Poroshenko told the crowd in a taped video address. "This memorial is proof that neither hard times nor the criminal intent of our enemies will conquer our nation as it seeks truth, freedom, democracy and peace on its own soil and in its own country," he added, according to an English translation provided by organizers. Exactly how many people perished is unclear. The US Committee for Ukrainian Holodomor-Genocide Awareness 1932-1933, citing scholars, puts the number in the three million to five million range while noting that some journalists who were in Ukraine during the 1930s gave higher figures. The ceremony comes amid a conflict between Kiev and Moscow that erupted in the aftermath of 2014's pro-democracy revolt and has killed thousands. "The Kremlin, once again, as in times of Holodomor, is trying to erase Ukraine from the map. Once again the threat of death is coming from the east," Poroshenko said. 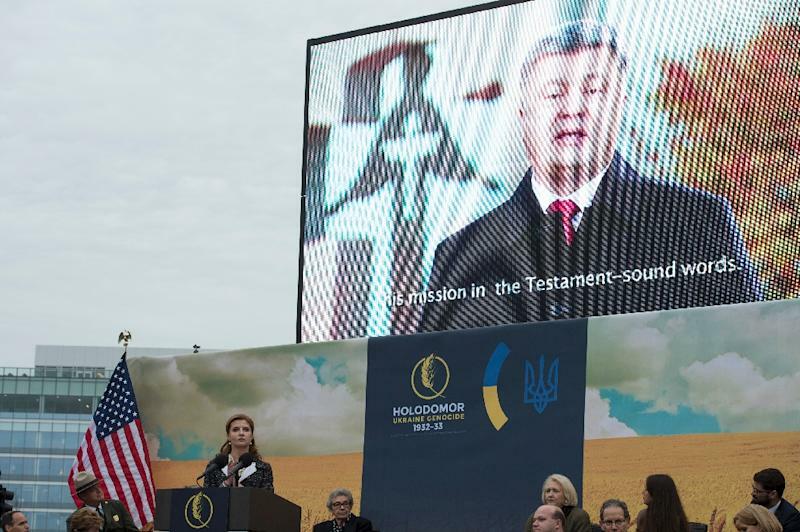 The White House issued a statement in remembrance of the Holodomor, saying that despite decades under totalitarian rule, Ukrainians "refused to abandon their drive for freedom and independence." "And as the Ukrainian people face new threats to their territory and well-being, they have once again demonstrated their resolute commitment to human dignity," it said. Legislation adopted by Congress and signed into law in 2006 authorized the establishment of the memorial on federal land. Drizzle provided a somber backdrop for the ceremony, which drew droves from Ukraine's US diaspora. "This is the most tragic moment in our history," said Roman Panchishak, who came from New York state. "Ukrainians have never been the same," added the 37-year-old, clutching a small Ukrainian flag. Gromow emigrated to the United States in 1951 and now lives in Utica, New York. She recalled how her mother hid green beans in a barrel covered in snow, helping the family make it through winter. "I'm always crying," Gromow said, her eyes brimming with tears.